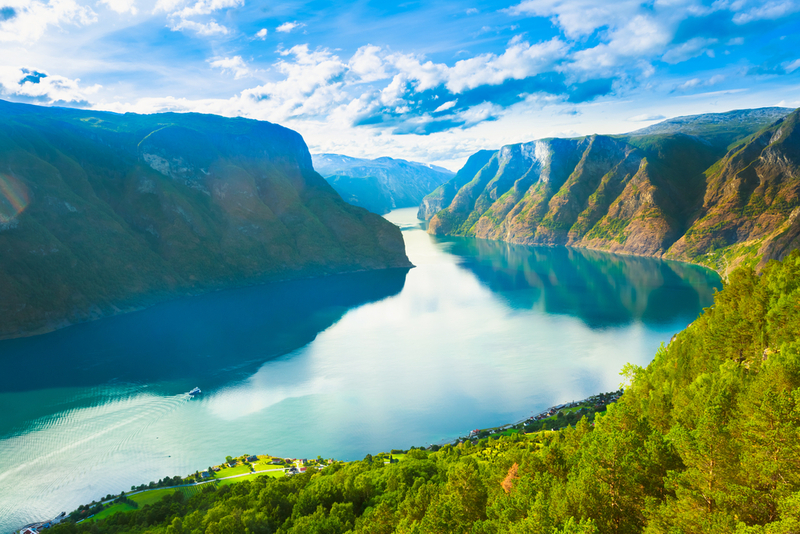 From the ethereal beauty of the fjords to the spectacular mountain views, Norway has many attractions worth visiting. Do not miss its historical cities of Bergen and Oslo, filled with museums. There are many more places to visit in Norway. The easiest way to get here is to fly into Oslo, spend a couple of days exploring its museums and its famous Vigeland sculpture park, and then head to the historical city of Bergen, surrounded by seven mountains. Take the cable car to the top of Mount Fløyen to enjoy views towards the city center. Sample authentic local food at the centric Fish Market, and enjoy a stroll around the area of Bryggen, another World Heritage site. After that, take one of the many tours around the fjords, many of which can be reached from Bergen. Most tours start by taking a train across the highest altitude railway track in Europe, an experience in itself. Admire the Nærøyfjord and Sognefjord fjords together with the Kjosfossen waterfall. If you like unique destinations of unparalleled beauty, then this is your ideal place to be, for the country’s fjords have been named the most unspoilt tourist destination by the National Geographic. Do not forget to book your flight in advance and explore this magical place. Who knows, maybe you will bump into Olaf, the talking snowman, on your next trip? Trondheim is a larger town located in the same region. In this town you will find traditional architecture, with the characteristic timber houses that are prevalent in the region. Check out the ancient Nidaros cathedral and enjoy a walk around the town’s most famous area, Bakklandet. If you want to see what inspired the royal residence seen in the movie, then take a tour around Stiftsgården, the local royal residence with more than 140 rooms built with elements of baroque and rococo. Another way to explore Trondheim is by taking a boat tour to Munkholmen, an island north of the city known for its Benedictine monastery that was later transformed into a fortress.